CEITR research teams demonstrated a great presence at 2018 KWB/UOPX summit. Many of the research teams developed their studies within CEITR research labs or special interest groups by integrating the center 5S conceptual model. 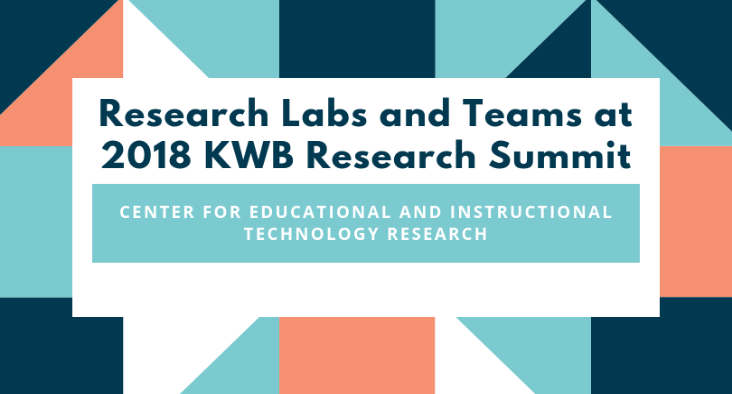 CEITR researchers presented a total of 31 studies at 2018 KWB summit, 21 studies belonged to a CEITR research lab and 10 studies were individual projects at CEITR. Such a high number of presentations indicate the effectiveness of 5S model used at the research labs and strong dedication, engagement, and collaboration of CEITR researchers. To learn more please visit CEITR Research Labs and Communities. Dr. Mansureh Kebritchi, Chair if CEITR would like to recognize all the research teams who presented at 2018 KWB as follow. 1. Crises of Care and Critique: School Leaders and Narratives of Compassion Fatigue – James Lane, Ramona Phillips, Yvonne Hefner, Karyn Hawkins-Scott and Sally Everts. 6. An Exploratory Phenomenology Study of Educators’ Bullying Experiences in the Workplace - Cheryl Burleigh, Ronda Gregg, and Tammy Cagle. 8. Virtual/Mixed Reality: Next Generational Users of Instructional Tools for K-12 and Higher Education – Dale Crowe and Martin LaPierre. 13. Using Story-Telling and Role Play as a Learning Strategy for Incarcerated Women - Cheryl Burleigh, Nola Veazie, and Elizabeth Johnston. 14. Career Professionals’ Reflections on Exposure to Early Music Training – Rita Hartman, Liston Bailey and Jennifer Calito. 16. Examining the Influence of Online Science Kits on Student Science Achievements – David Proudfoot and Mansureh Kebritchi. 17. STEM Certification in Georgia Schools – David Proudfoot, Michael Green, Jan Otter, and David Cook. 26. Deconstructing Stormbot: A Literature Review regarding the use of telepresence robots in education – Medgar Roberts. 27. Millennial Soldiers Lack Effective Face-to-Face Communication Skills: Delphi Study - Elizabeth Young and Thomas Clark. 30. First Responders using Mindfullness Strategies - Elizabeth Young and Scott Drexler. 31. Does Moral Leadership Conflict with Organizational Innovation? – Sandy Nunn and John Avella.